Make this Easy Pressure Cooker Cranberry Sauce Recipe (Instant Pot Cranberry Sauce). Tangy & sweet fresh homemade cranberry sauce is great as a jam-like spread, topping for desserts, filling for pastries, glaze for meat, or extra flavor for yogurt/smoothie. Don’t just save it for Thanksgiving and Christmas dinner! Have you started planning or dreaming about the holidays? Thanksgiving and Christmas are definitely 2 of my favorite festive holidays. Reunions and celebrations with families and friends. Full of warmth, joy & love. And of course – Food!! It’s a time to give thanks, a time to reflect, a time to remember, a time to reconnect. reserve some quiet time for yourself to reflect and look ahead. Have you ever tried adding cranberry sauce to your homemade BBQ sauce? 1. Why Make Cranberry Sauce in Instant Pot or Pressure Cooker? The pressure cooker provides an ideal condition for creating a jam-like cranberry sauce. 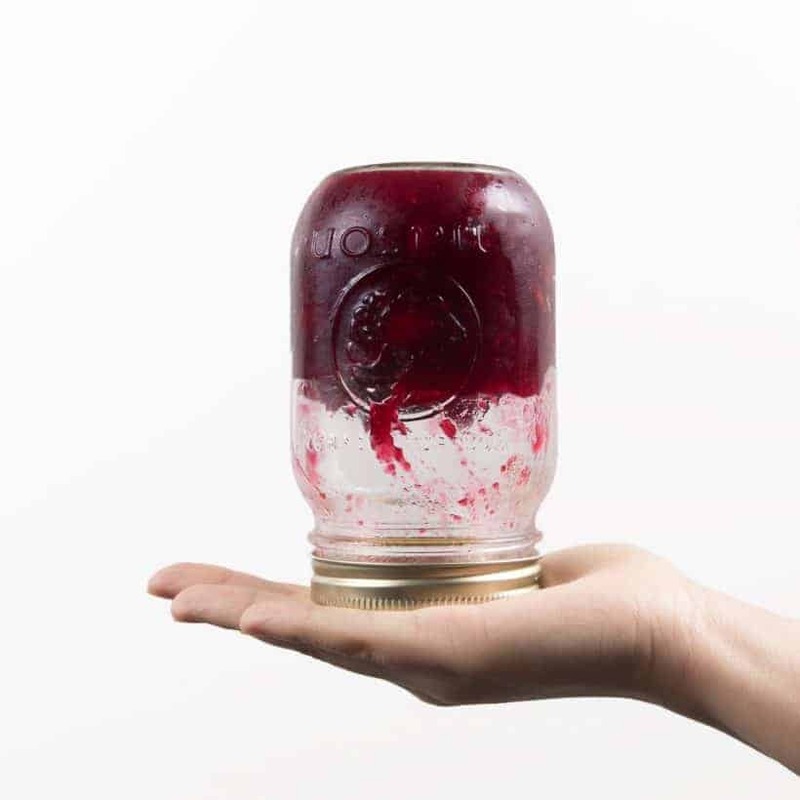 More pectin extraction and less water content means less sugar is require to create a jam-like cranberry sauce! 2. How to Select Fresh Cranberries? Choose plump cranberries that are deep red in color. They should be quite firm to touch (you can actually bounce them if they’re fresh). 3. Can I Double This Recipe? Yes, this recipe is scalable. Please do not fill more than half way full as cranberry sauce can be foamy. Always use natural release method for this recipe. 4. Can I Substitute White Sugar with Other Sweetener? Yes, you can substitute white sugar with other sweetener such as maple syrup or honey! 5. The Cranberry Sauce is Too Thick for My Liking. How Do I Adjust The Thickness of The Pressure Cooker Cranberry Sauce? You can add in water on medium heat to adjust the thickness. 6. How Long Can I Store My Fresh Homemade Cranberry Sauce in The Fridge? You can place them in a jar. It will last 10 -14 days in the fridge. It will keep 1 -2 months in the freezer for best quality. 7. What Can I Make with Leftover Cranberry Sauce from Thanksgiving Dinner or Christmas? 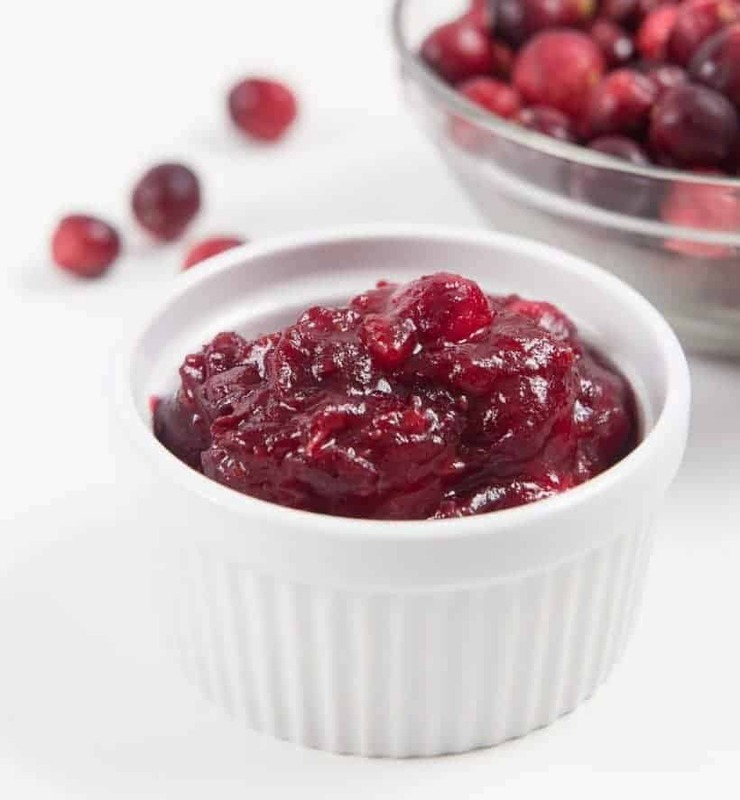 Tangy-sweet homemade cranberry sauce is great as a jam-like spread, topping for desserts, filling for pastries, glaze for meat, or extra flavor for yogurt/smoothie! Wash the Cranberries: Remove the stems. Rinse cranberries under cold running water. Discard the soft, discolored & wrinkly ones. Pressure Cook the Cranberries: Combine 2 tbsp (30ml) maple syrup and ¼ cup (65 ml) orange juice and pour into the pressure cooker. Add 2 ½ teaspoons (12 g) orange zest and place 10oz (280g) cranberries into the pressure cooker. Reserve the other 2oz (60g) cranberries. Close lid and pressure cook at High Pressure for 1 minute + 7 minutes Natural Release. Open lid carefully. Make the Cranberry Sauce: Turn heat to medium (Instant Pot: Click cancel and Sauté button). Stir and break the cranberries with a wooden spoon. Add in the remaining cranberries and ½ cup (115g) of white sugar. Stir and the heat will instantly melt the sugar to form a thick cranberry sauce. Add a pinch of salt. Taste and add more sugar if desired. Consistency: Add water on medium heat to adjust the cranberry sauce's thickness. Spices! I’m a spicy kind of girl and put 2 little cinnamon sticks and a dash of cloves in mine. I also add an 8 oz can of crushed pineapple in mine. I deduct the liquid to 1/8 c orange juice or just a squeeze of an orange. It’s just a little sweeter and more interesting to the tongue. I forgot how quick this is to make. I’ve run out since making it in November and love it on my turkey sandwiches! Yum! I made this for this past Thanksgiving. It was a last minute decision to make it, as Ive been terrified to make stove top cranberry sauce ever since my mother told me her story of being a newlywed and having to make it for her first Thanksgiving at her inlaws- the berries all popped and she had cranberry sauce all over her walls and ceiling! I think she made too much! This was super easy, super safe and super good!Everyone raved about it, and it will be a Thanksgiving staple from now on. I followed the recipie exactly, but after reading comments made a batch with a little brandy, and a batch with some Grand Mariner. Both a tad different, but flavorful and seconds and thirds were had by all. I had to hide some for my leftovers! Thank you! Thank you for this recipe. I just finished making it and it is delish. I doubled the recipe but that was my only alteration. I think I’ll triple or quadruple it, next time. This is going to be INHALED at dinner, tomorrow. Thanks again! I got a 3 qt Instant Pot this summer and have been wondering if I could replicate my favorite cranberry sauce recipe come the holidays. Using your recipe to start, I added an extra tablespoon of maple syrup. Then after the sauté step was done, I added ¼ cup of crushed pineapple and a heaping ½ teaspoon of cinnamon. Eureka!! It tastes just like the cranberry sauce I’ve been making for 40 years – and only took 30 minutes from start to finish. Thanks so much for this recipe and Happy Thanksgiving you two pressure cooker genies! Happy to hear you enjoyed this method. Thanks again for a wonderful recipe! So much easier and faster than the traditional way of cooking cranberries. I added a teaspoon of cinnamon (I tripled the recipe) and a 1/4 cup of brandy which really helps to blend the flavors in a wonderful way. Now I will be scouring your site for more recipes. Thank you so much once again for your kind words and support! I just made this recipe in preparation for Thanksgiving dinner. Wow! I’ll never get the stuff in the cans again! So easy! Today’s run was just for myself and my son. Tomorrow I get to make it for a dinner for 10. 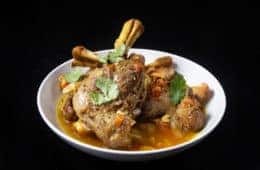 What changes do I need to make to the recipe? Thanks for all your wonderful recipes and hints for using my new toy! Hope this reply is not too late. No adjustment is needed, but you will want to natural release it as it can be quite foamy. This is FABULOUS! I made it today (3 days prior to Thanksgiving feast). It was easy to make with just the right amount of tartness/sweet. I did decrease the amount of orange zest to 1 teaspoon, and felt that was just right without overpowering the flavor. And what a gorgeous color — just like a sparkling ruby! I never made homemade cranberry sauce like this before, but this will be our “go to” holiday recipe from now on. No more canned garbage…this is so flavorful. And any leftovers would be great on Swedish Pancakes! Thanks to you I’m having a great time creating exquisite dishes with my electric pressure cooker. HAPPY THANKSGIVING TO YOU! This recipe was super easy, but also a little too sweet. I’d recommend folks start with less sugar than the recipe calls (maybe start with 1/4 cup) for and add to taste. Thank you for your wonderful recipes. One quick question: When a recipe calls for “natural release”, is that something that occurs during the cooking process or is there a button I need to press for this? The directions booklet that came with my instapot did not mention anything about “natural release”. Thanks! The natural release occurs naturally. You can read more about natural release and quick release here. I am allergic to oranges. Any suggestions for a modification? Thanks! How long can this be stored in the fridge? Can it be frozen? Is this to be put in canning jars to be seeled? Here is the chart for this recipe. You can also seal this in canning jars. 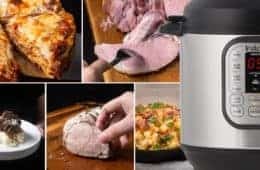 Could you make the cranberry sauce in the new Instant Pot Ace blender? What would you change to do this? I think it will be easier to make this recipe on a regular sauce pan. You can bring the orange juice and cranberry to a simmer and cook for roughly 10 minutes. Then add in sugar to dissolve and thicken. I stock up on fresh organic cranberries when they are in season. I need to make room in my freezer. I always enjoy home made cranberry sauce during the holidays. It is one my most requested food to bring when invited for holiday dinner’s. I’m wondering can it be watered bath canned and put in my kitchen cupboard for later use? I’m thinking I will thin it out a bit and can it in my electric Fresh Tech home canner. It’s very hot here now and that’s why I enjoy this electric canner..it doesn’t heat the house up like regular water bath canning does. My family likes jellied cranberry sauce, can I cook all the berries and put it through a ricer before adding the sugar? Could this be made with dried cranberries? If so, would I need more liquid? Dried cranberries can be used for cranberry sauce. I would say roughly 1/2 cup – 1 cup liquid. Wow! This tastes just amazing. Reminiscent of what grandma served in the 60s. I’m that old, and to think it took til now to get this! Thanks from the SW Oregon coast, where I just picked up bags and bags of discounted regional cranberries from a local store. Happiness is cranberries to play with! Hi. I usually add a bit of Grand Marnier to any of my cranberry sauces that have orange in them. 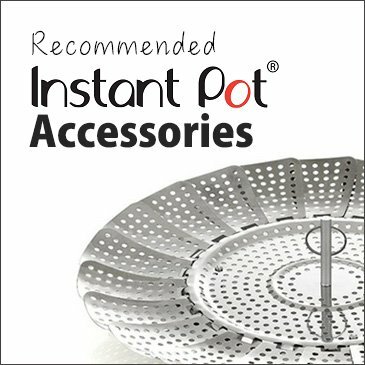 Can I still do this with the Instant Pot? I have been to afraid to try anything with alcohol in it for fear the whole thing will blow up! It should work just fine, but I would recommend the safest method. You will probably want to bring it to a simmer to evaporate some of the alcohol before pressure cooking. This is a keeper! I made it for Thanksgiving and have in in the Instant Pot now for our Christmas dinner. I am one f the few in my family that enjoys cranberry sauce but this is easy and delicious enough for me to make it even if I’m the only one that will enjoy it. Thanks! Hi I make this same recipe on the stove top, but I add cut up apples and lemon zest. Can I cut up apple to this recipe or will it go soggy and break up? The apple will turn into applesauce mixture after pressure cooking. If you are looking for the crunchy texture, it will be better to add in the apple after pressure cooking. I wanted to make this recipe for Christmas Day. I only have frozen cranberries. Is it better to defrost these first or put them in straight from the freezer? For this recipe, you can just put them in straight from the freezer. Merry Christmas and happy holiday to you and your family!! I made this today for hostess gifts (and a present for me). It turned out really well, as do all your recipes. I was a liiiittle doubtful about leaving cranberries out to incorporate at the end, but then I remembered you haven’t led me wrong yet, and a team that takes 17 runs at a good cheesecake can be trusted. hehe thank you so much for your kind words Lea 🙂 !! We so appreciate your love and support <3 Thank you! We don’t need the whole history of cranberry sauce and all the ways to cook it. 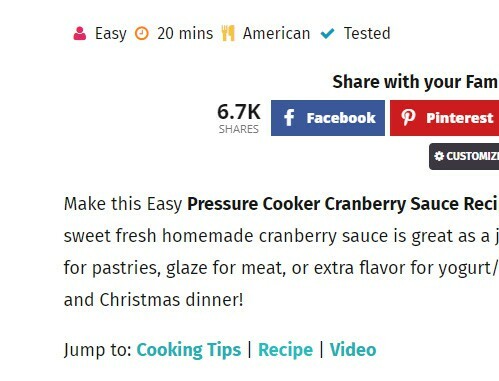 Just get to the recipe already, put that up at the top of your page so I’m not scrolling down for three minutes trying to find the recipe. Do you have recipes for Crandberry Chuney. Cranberry Chutney’s cooking method is quite similar. Made a double batch! This is excellent cranberry sauce! A “must have” with turkey, so delicious on leftover turkey sandwiches, as well as just eating as a side! I figured out why the sauce was so strong flavored. I processed it for 7 minutes instead of 1 minute, then 7 min natural release. Oops! Wish I had seen your recipe before I bought mine at the deli. This looks and sounds really perfect. Thanks for all of your ideas! Happy Thanksgiving to you and your family!!! Just made this recipe and the texture is perfect. I like adding the sugar at the end to get it to the sweetness I prefer. However, the orange zest gives it an incredibly strong (overpowering) orange flavor. I just looked at another recipe, and it calls for only 1/2 tsp zest, stirred in at the end. I’m not sure I can serve this as is, so I’m going to try to dilute it somehow. The orange flavor was quite subtle in our batches. It could also be the orange juice as well. Do you remember what type of orange was used for the zest and juice so I can give it a test. I like to add about a half bottle (or to taste) of Heinz chile sauce. It’s a nice contrast to the sweet and tart of the cranberry sauce! Hope you have been doing well Liz! Thank you for the recipe, I just made this. I used 1/2 cup of sugar and it came out perfect,, the best, and so easy! Thanks again! Just finished this recipe in anticipation of our Thanksgiving dinner. It is a great recipe. Results are perfect. It makes 18.26 ounces (2 1/4 cups of cranberry sauce) Go easy on the orange peel if you don’t love the orange/cranberry combo. Thank you so much for your kind comment and sharing your result with us! I am planning to make this next week for Thanksgiving. I didn’t see anywhere the amount the recipe makes. Do you know? I only saw mention of serving size: 1 cup. Not sure if that refers to the amount the recipe makes or an actually suggested serving size. Thank you – really looking forward to making and enjoying this! If I remember correctly, this makes 500ml mason jar worth of cranberry sauce + a little more. thank you so much for this recipe. I like making my own. What can I switch out for that orange juice . I don’t like cranberry orange. Would it still work OK with raspberry juice maybe? Would this method work if I want to make my own strawberry jam? I might need to add in some agar-agar powder in the end to thicken it? 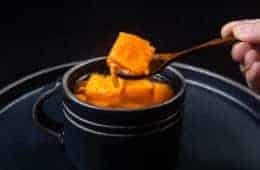 You will probably need to use a thickener at the end such as agar-agar powder to thicken it a little. Thanks for your delicious cranberry sauce recipe. According to your instruction, I tried it myself at home and made the tasty sauce. One thing I wanna know from you which cooking pot is the best for the kitchen? High quality Tri-ply pot will be a good start. Great recipe, I made it the exact way your recipe says and it is so easy and delicious. Have a Merry Christmas and thank you for your time and recipes. Glad you enjoyed the cranberry recipe and thank you for your kind words! You mention pectin in a couple of your responses but I don’t see pectin listed in the recipe…..am I missing something? Cranberries contain high amount of pectin in them. The pectin I mentioned in a couple of my responses were referring to that. Hi – would very much like to try this. Can it be made with no sugar? Could the sugar at the end be subbed with honey as well? Can it be made PIP? Thanks! Honey should work as a substitution. 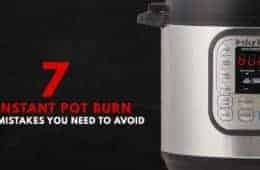 Pot in Pot will work. You will need to add a few minutes cooking time depending on what container you are using. I’m wondering, why are the extra cranberries and sugar added at the end rather than putting everything in at the beginning? I’ve seen other recipes where everything is dumped in, so just wondering what the difference is. Thanks! The extra cranberries mixed in at the end is to create two different textures for a better mouth-feel. 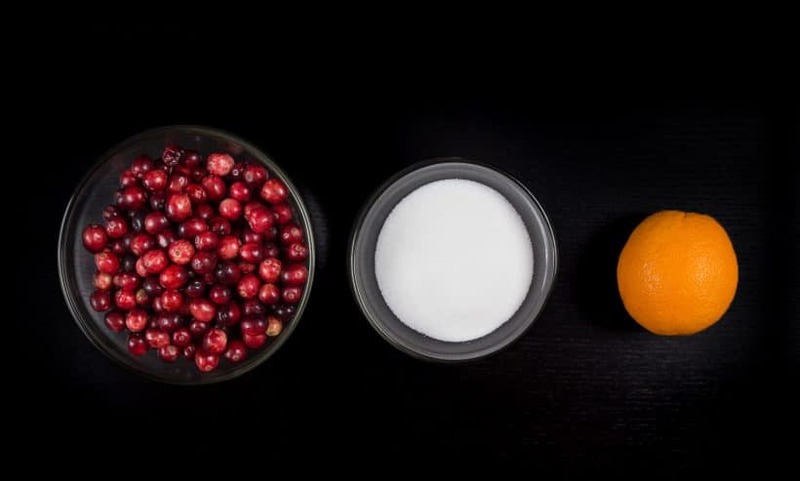 The sugar has two uses in the cranberry sauce. 1 – it sweetens the cranberry sauce. 2 – it helps the pectin to bond together to create the gel-like texture. My husband prefers the jellied version of cranberry sauce. Would I be able to achieve that if I press the end product through a fine mesh sieve? Or would it make it more liquidy than jelly? Any help is greatly appreciated so I don’t have to eat the canned stuff this year! thank you for your question. You can place all the cranberries in the beginning and it will come out a bit thicker. This version of cranberry sauce is quite thick and jelly on it’s own after cooling, but if you want it to be like jelly, more gelatin or pectin has to be added. Think this would work with frozen cranberries? If so, how would you adjust the cook time? I just finished this quick cranberry sauce and it is absolutely delicious. I don’t under stand the time. 1 min cook time and 7 min NR? 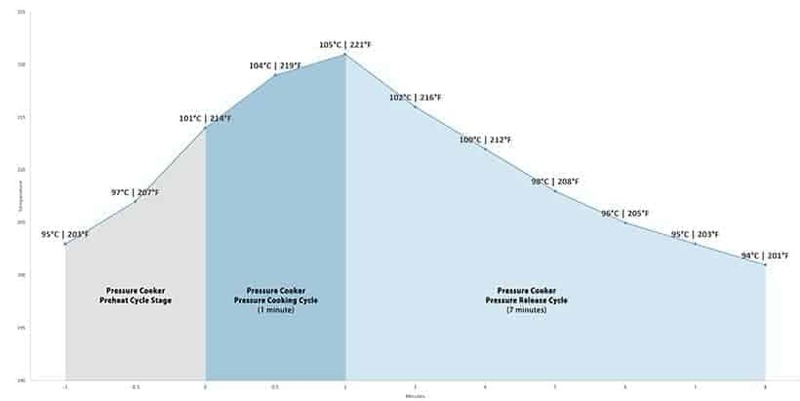 If you are using a electric pressure cooker, set the pressure cooking time to 1 minute. After the pressure cooker has finished the cooking cycle. Wait 7 minutes before opening the lid. I don’t see in the directions when the orange zest is added. Does it get cooked with the cranberries or added in the final step? I’m sure it will be great either way, but I wanted to follow the directions! Thanks! Thank you for your question. We completely missed the orange zest in the recipe card. The orange zest are supposed to be added right after the orange juice + maple syrup have poured into the pressure cooker. This doesn’t have the required 1 cup liquid my Instant Pot requires to build up pressure. So how does it work? Yes this will work in the Instant Pot. The 1/4 cup of juice and 2 tbsp of maple syrup will be enough liquid to get up to & maintain pressure in the Instant Pot. The cranberries will also excrete their juices too. With that said, we have tested both our DUO60 and IP Smart with 1/4 cup of cold running tap water. They both got up to & maintain pressure with only 1/4 cup of total liquid and is okay to use with pressure cooking time less than 5-10 minutes. Thanks so much for the quick response. I’m new to the Instant Pot community and have only had the time to try a few recipes so far. With fall here and more time on my hands I am looking forward to seeing what I can do with this new toy. I was just concerned because the IP manual states over and over that you MUST have at least 1 cup of liquid or the Apocalypse will somehow occur. Good to know that I can make this without causing the end of the world as we know it. 🙂 We eat cranberry sauce year round at my house so am going to be making this over the weekend. Congrats on your new toy. 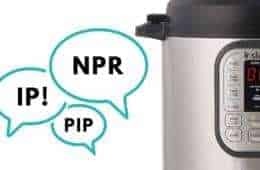 Leave a comment or send us an email if you have any question about pressure cooking! Just finished making this. WOW. Very good. So easy and so much better than the canned stuff. Used honey instead of maple syrup. I live in a small town in East Texas (yeah, I know) and I’d have to drive an hour and pay dearly for real maple syrup. However, we do have some local sweeteners — sugar cane syrup, ribbon cane syrup and malasses — all of which have a nice deep sweet umami flavor that I think might work well with the tart cranberry. Will try next. Thanks for this great and easy recipe. Highly recommended. 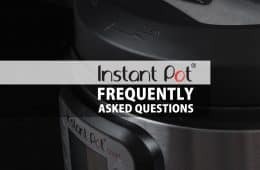 Now, on to my next adventure with my Instant Pot. Thanks again. Thank you so much for the hospitality! Sugarcane juice is one of my favorite juices from childhood.